Some medical conditions will worsen when it gets colder out, “one of the main ones would be arthritis,” according to Dr. Jason Nicholas. Arthritis might worsen in the cold months “because of the direct effect of the cold [which can cause] increased stiffness, and because the cold frequently brings icy/slippery streets and sidewalks.” Before it gets to be wintertime your dog should have a checkup. Having your dog checked by a veterinarian can help ensure that problems don’t worsen when the temperature drops. This visit is also your best opportunity to ask your veterinarian about winter care. Although all dogs are at risk in the cold weather, some are better equipped to handle it than others. Huskies and other breeds from cold climates are certainly going to be more comfortable than other dogs, such as the Italian Greyhounds, when wading through a winter wonderland. Also consider that old, young, wet dogs or dogs with thinner coats are at a greater risk of getting hypothermia and/or frostbite. Winter is a great time to get closer to your pets. They want to be inside with you where it’s warm. Short, frequent walks are preferable to extended walks during this time of year. After that, it should be right back inside to clean the snow and ice from between their toes. This isn’t to say that you should stop exercising your dog when it gets cold outside. The winter is the perfect time to enter your dog into daycare so that he can burn off excess energy in a safe and social place. Don’t forget about playtime at home either. Most dogs would love to chase a plush toy through the hallways. Antifreeze is a common cold weather poison but not the only one to be aware of: road salt and rodent poisons are also used with greater frequency during this time of year. Even if you don’t use any of those products, an unsupervised pet could easily wonder into a neighbor’s yard and find them. Dogs may also lick their paws after a walk. Every time you come inside with your dog you should dry his feet thoroughly with a towel to be sure he has not tracked in any dangerous chemicals. Also check him over for any injuries to the paws: cracks, cuts, or scrapes. These kinds of injuries can cause pain and lameness. Use pet friendly deicing products on steps, walkways and driveways. Because dogs rely heavily on a strong sense of smell to figure out where they are, they can easily be lost during winter storms. Snow covering the ground will make their surroundings less familiar. Keeping your dog on a leash at all times – especially during winter storms – can help stop your dog from becoming lost. You may also ask your veterinarian about microchipping, just in case. For small dogs in particular, sweaters are not a joke, they’re actually very important during the cold weather. Small dogs have a larger surface area for their body weight and benefit greatly not only from a warm shirt but also from booties. Editor-in-Chief for AdvoCats and President of ‘cause Digital Marketing, confirms that dog clothing is no laughing matter. 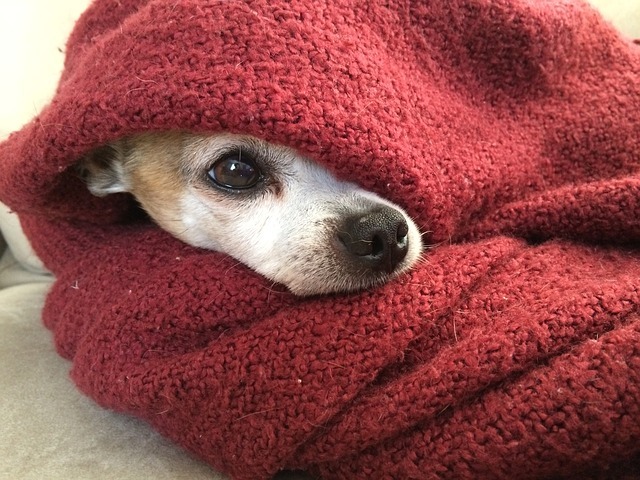 “My adopted Italian Greyhound, Fiona, doesn’t love the winter cold so I bundle her up in a sweater, a winter jacket, leg warmers, a neck warmer and am looking into getting booties to help her weather the Maine winter.” If you do get booties for your dog, Dr. Nichalas urges that you make sure they’re well-fitted and have good grip to prevent causing slips and falls. This rule is also important during the summer; a parked car can quickly amplify the affects of extreme weather. During the winter it can act as an icebox and trap cold air inside. It’s important to walk a fine line when grooming your dog during the winter. Taking too much hair off will mean he has less to keep him warm; leaving too much on will make brushing more difficult and could lead to matted hair. Ask your veterinarian how often he recommends grooming based on your breed of dog. He should have comfortable spots in both hotter and cooler regions of the house. This will allow him to move around at night if he’s uncomfortable. Never use a metal water dish outside in cold weather because your dog’s tongue can get stuck! (Think of the flag pole when you were a kid.) You can also consider purchasing a heated water dish (normally used for feral cats) so that your dog doesn’t have to drink frigid water or be challenged to get enough to drink from a frozen water source. Your dog will also need to eat more during the winter because it takes more energy to keep warm; however, don’t make the mistake of feeding too much. Obesity carries health concerns of its own. By following these precautions and seeking advice from your veterinarian you can give your dog a safe and happy winter season. Enjoy!